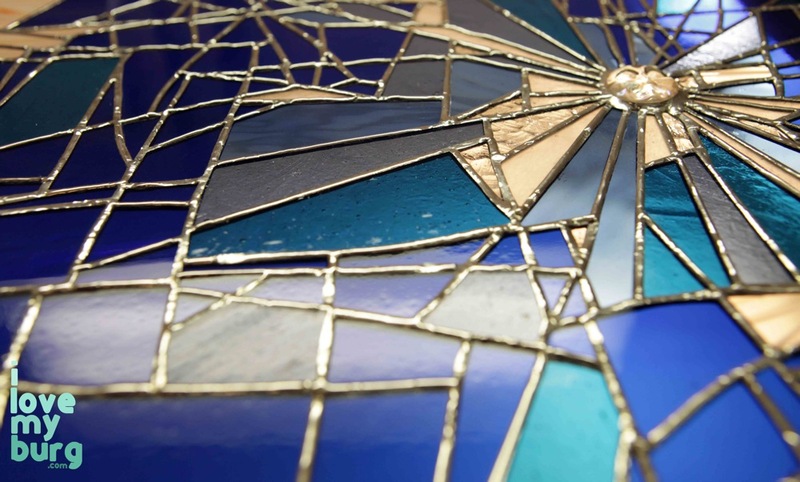 glass act: ZN stained glass. | i love my burg. 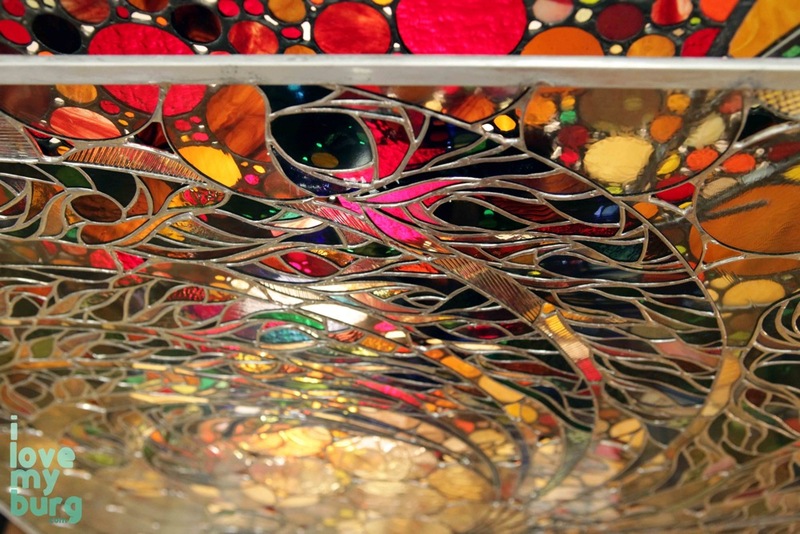 glass act: ZN stained glass. Sometimes doors close for a reason. A beautiful one. This was the case for Zac Nafziger, a former employee of Rosetta Stone who, along with several others, was laid off after twelve years with the company. He had enjoyed the steadiness of it, the reliable pay and benefits, the friendships forged there. He had enjoyed working in the heart of the city, watching it change and grow, watching the company change and grow from a small business to a formidable global presence. And so, when the layoff occurred, it was like a strange break up — at first, heartbreak and shock, but then a realization that the relationship had indeed changed, and maybe it was instead an opportunity. 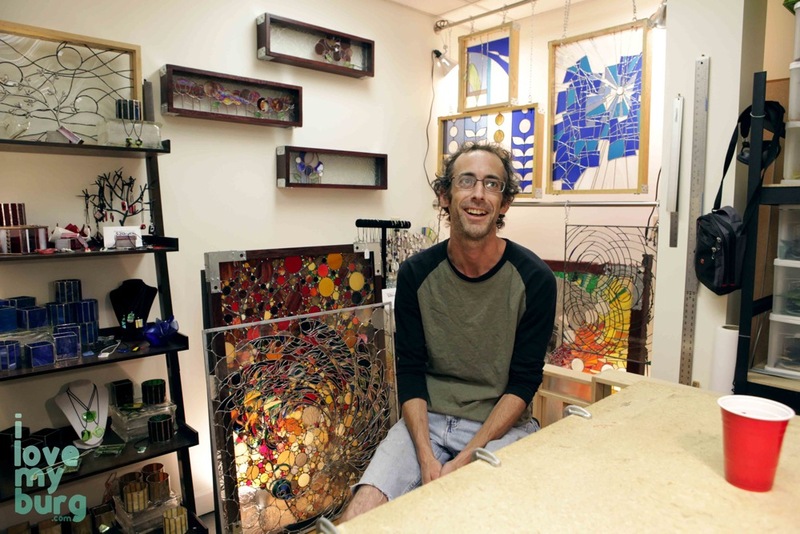 Having studied, appreciated, and practiced art since his adolescence, Zac soon decided that the most feasible option for him and his family was to dive headlong into the stained glass business — the selling of it, not just the making of it, which was new and slightly uncomfortable territory. Today, suddenly he finds himself doing just that: he reports to his studio at Larkin Arts each day, makes stained glass, and sells it. And although he no longer has the safety net of a bona fide employer, he’s doing all right. Moreover, he’s a happy fellow. 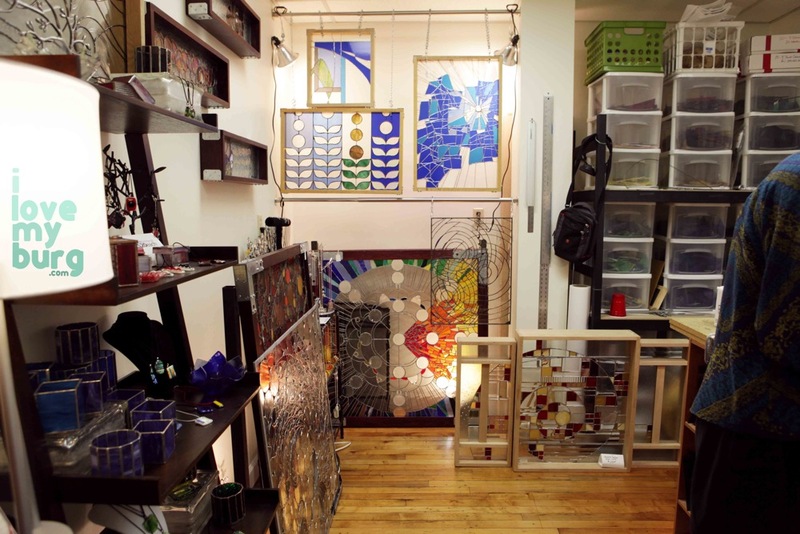 He packed up all his gear and supplies and traveled 1500 miles to set up ZN Stained Glass in a studio space at Larkin Arts, just a block or two from his former job. Yep, 1500 miles. 15 miles, 100 times. He has a lot of stuff. He does note some important differences between being your own boss and working for someone else. For example, you don’t get paid when you use the restroom, or leave for a quick lunch, or chat with a colleague. No. Now, any sort of break during the day costs him money. If he’s not working, he’s not earning, and that’s an interesting reality many of us don’t know. It might sound great to set your own hours and work wherever you want… the library, a coffee shop, at home… but it takes discipline. As he says, at home there’s always some distraction. The TV, or the Internet, or some household task. Suddenly the day is gone and nothing’s accomplished. Bleeding money. So he tries to work at Larkin as much as possible. There’s really nothing else he can do in his small studio but produce. 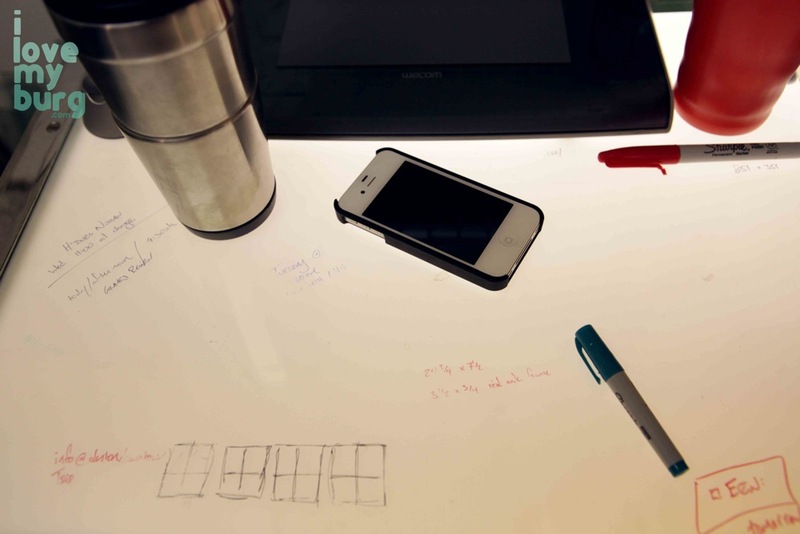 His process is interesting yet simple. His inspiration comes in the form of personified ideas that talk to him, usually interrupting him while he’s already working on a piece. So he might sketch that idea just as a reminder, and then draw a full-size picture of it before he starts to cut glass. He might put on a movie or a series of reruns just for background noise (this is part of Brandy’s process, too), but sometimes he works in total silence. He usually works barefoot, and his work table becomes a glass-shard pricker bush that slices his forearms when he leans into it. (I know it sounds masochistic, but it’s the process, people.) Many of his works, as you can see from the photos, contain circles and geometrics, some that are sort of pattern-ish and some seemingly random, but all somehow adding up to a cohesive, comprehensible, eloquent final product. This appeals to people because much of his work is beautiful without it having to be something. There might not be a single recognizable object in one of his works, but its arrangement is gorgeous in a way you won’t grow tired of. There’s a quiet, timeless sophistication about his work that cannot be acquired in the home goods section of any store. If my description falls short, which I’m sure it does, just go on down to Larkin and see him at the studio. He’s quite friendly and seems to like talking about his work and current projects; right now he’s working on stained glass inlays for an entire kitchen’s worth of cabinets, plus wine cellar doors. Other than his artistic abilities, he says his strengths lie in cooking on the grill, solving problems, and being able to see the big picture… which all sorta relate to his craft if you think about it. 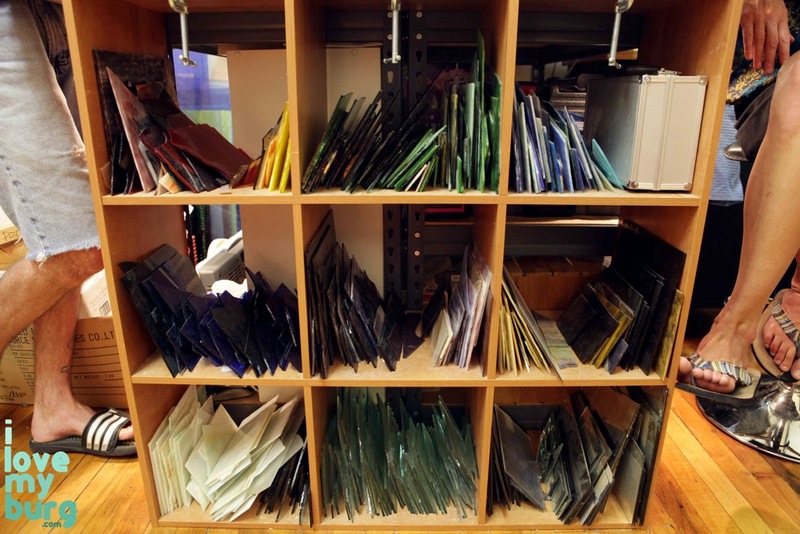 I mean, you have to be able to see the big picture when you’re arranging a couple thousand tiny pieces of glass. And his latest news is this: he pretty much bought Avalon Stained Glass School in Kentucky and everything inside it, and he’s driving to Kentucky this weekend to get the loot. It’s like FIFTEEN years worth of glass. So he was pretty excited when we were there with him today. 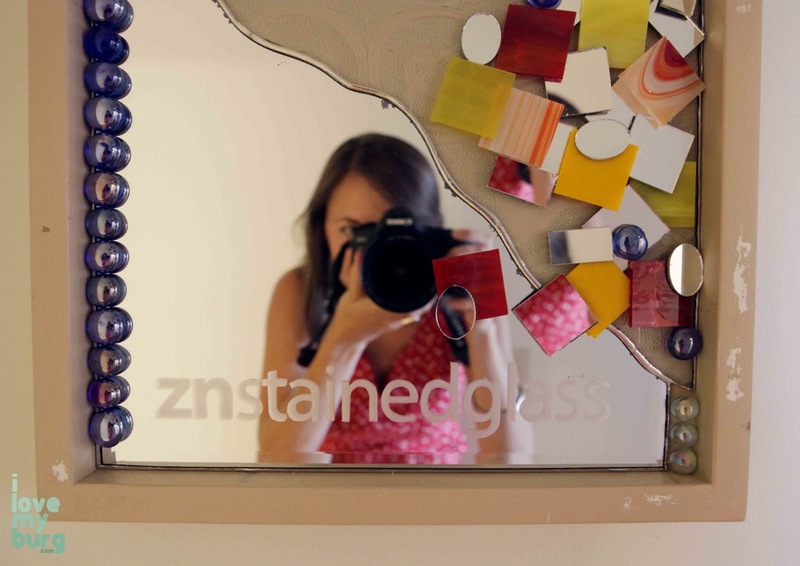 When I first saw the name of his business — ZN Stained Glass — I thought it said “zen.” And then I wondered if his middle name starts with an E, because it would be cool if ZEN were his initials. They’re not. But I refuse to let go of the yin/yang thing going on here… that he lost his job, which seemed like a disaster, but it turned into a blessing lined with luck and hard work and faith. Two sides of the same coin. You know, like a circle. 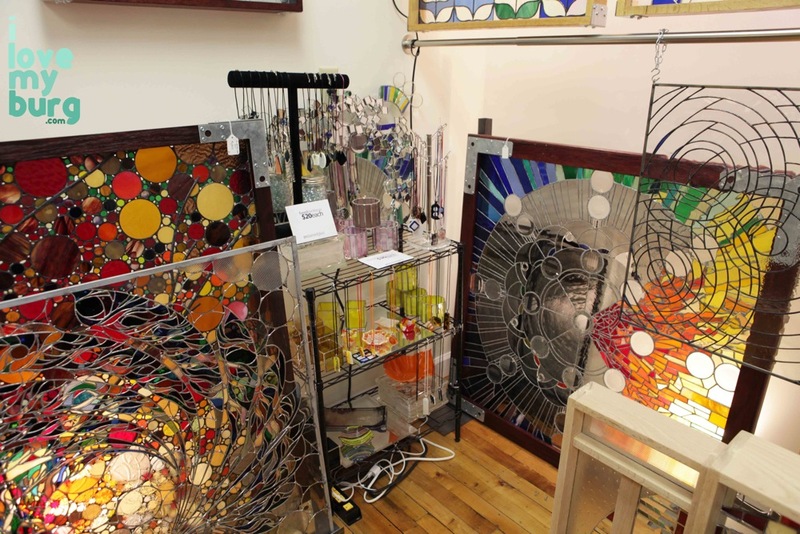 This entry was posted in retail and tagged art, art studio, Brandy Somers, Harrisonburg Virginia, Katie Mitchell, Larkin Arts, stained glass, yin yang, zen, ZN Stained Glass by junebug. Bookmark the permalink. Nice article. So glad I was able to visit your studio recently. Are you going to need storage for your new purchase from Kentucky? Great to see a young artist creating such awesome work ! I will make it a point to stop by and check out his work..
Pingback: burn, baby, burn: breathe. | i love my burg. Nice article. Zac, I have to come see your studio next time I’m in the ‘Burg. But seriously, barefoot? Glass in foot is no fun–I know from experience.